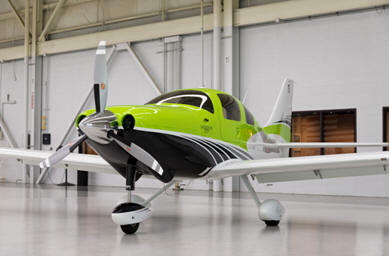 July 2, 2013 - Cessna Aircraft has begun delivery of the first production units of the Cessna TTx. The TTx holds the distinction of being the world’s fastest commercially produced and certified fixed gear single engine aircraft. The Cessna TTx is a high performance, all composite aircraft, with a 310 HP Continental TSIO-550-C engine. The TTx is designed for advanced pilots with advanced technology and greater comfort in mind. The leather wrapped side stick control and additional horsepower provide advanced TTx pilots with speed and performance close to that of a jet. The speed comes with style, as the fit and finish of the TTx has been likened to detailing reminiscent of a luxury sports car interior. One of the customers accepting delivery is David Barnes, Chief Executive Officer of Watermark Retirement Communities. Barnes said he plans on using his TTx to travel between the 32 Watermark properties throughout the country. Representatives from Pacific Air Center (PAC) were on hand to assist with the event. PAC is a Cessna authorized sales center covering the southwest United States, with bases in Long Beach, Calif., and Scottsdale, Ariz.
Production line flow of the TTx was announced in April of 2012 at the Sun ‘n Fun International Fly-In and Expo in Lakeland, Fla. The aircraft has a top speed of 235 ktas (270 miles per hour), an operating ceiling of 25,000 feet and an optional Flight into Known Icing (FIKI) system, enabling pilots to file flight plans allowing for varying weather conditions. The TTx is the first aircraft to be equipped with the Garmin G2000 avionics system which features a glass cockpit with dual 14.1 inch high definition displays and touch screen controls.